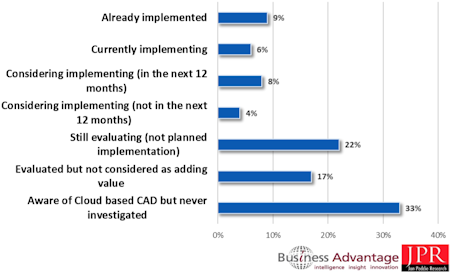 Jon Peddie Research and Business Advantage find that many CAD users aren't interested in cloud-based CAD yet — but the shift has begun. Almost every CAD vendor has plans for the cloud, but those plans vary from one to the next. Likewise, customers also have varying ideas about CAD-based workflows. At Jon Peddie Research, we have found that one of the problems underlying this inconsistency is imprecise definitions of terminology. Does CAD in the cloud (CiC) refer strictly to CAD work? Does the idea of the cloud include remote computing where the servers might be on-premises? Is the workflow totally on the cloud, or a combination of cloud and desktop? If we open up the question further — as we should — it becomes more complicated: What about product lifecycle management (PLM)? Analysis? Project planning? Collaboration? Jon Peddie Research and the Business Advantage market research group worked together to create a CiC report combining a user-based survey with historical data and information from CAD vendors. What we found was a mismatch between customer expectations and issues and vendors' plans: There are many ways to use the cloud, and vendors have many approaches to it. For this first survey, we narrowed the questions to primarily CAD in the cloud, meaning CAD provisioned in the cloud, and the most positive response we got back from customers was for hybrid arrangements: CAD both in the cloud and onsite. According to the survey, CAD users are afraid their CAD data could be trapped in the cloud or even lost, and for that reason they want to be sure to have corresponding data updated on their desktop or their company servers. These findings are backed up by statements from CAD vendors, who are finding the same attitudes among their customers. We are at the early stages of cloud-based workflows, especially for professional applications. The early models for cloud work, which include software as a service, known as SaaS (as used by Salesforce) and browser-based access (as used by SolidWorks, PTC, and Bentley Systems to varying degrees), may not be suitable for full-time use for professional CAD workflows. Indeed, the responses to the survey and additional research clearly reveal a population with mixed emotions about the cloud and the ways in which it might benefit their work. A good proportion of people are interested in CAD in the cloud, but fully 50% of those who completed the survey said they are uninterested in CAD in the cloud. On the flip side, 15% are considering or in the process of implementing it. Kathleen Maher is an analyst at Jon Peddie Research (JPR). By moving beyond information containers to timelines, the company hopes to give infrastructure professionals a better handle on the constant in AEC projects: change. At its annual Year in Infrastructure event, Bentley Systems honors notable applications of its software in infrastructure projects around the world, and also announces major news and product updates. The theme for this year's event, which was held this week in Singapore, was "going digital," explained CEO Greg Bentley. The goal is finding and reusing information across a project — which is only possible if it's recorded and stored correctly. According to Chief Product Officer Bhupinder Singh, data is the most challenging aspect of digital transformation: "Moving all of this data to the cloud doesn't help you get any more insights," he noted. Currently, companies are only analyzing about 1% of their data, he said; the rest is "dark data." On Wednesday, Bentley Systems annouced significant changes to its data management and collaboration strategy. The company unveiled the iModel 2.0 cloud platform and its first new service, iModelHub, for users of its ProjectWise project information management and collaboration services. "I think it's the most exciting thing we've ever done," enthused Chief Technology Officer Keith Bentley. According to the company, the iModelHub cloud service "synchronizes and distributes changes made through discipline-specific BIM [building information modeling] applications; aligns semantically and physically their constituent digital components; and maintains immersive visibility for comprehensive and continuous design reviews across all project disciplines and participants." Bentley Systems first introduced i-models back in 2009. These "containers" for infrastructure information were designed to collect all the files associated with a particular project into one, enabling users to "extract a snapshot" of the project. "That has worked out fairly well, but I think we need to improve on that," said Keith Bentley; the 2.0 version, he explained, it is both a file and a relational database. Cyrena Respini-Irwin is the editor in chief of Cadalyst.